i-Touch V15 Interactive Through-Glass kiosk with 15'' display. - Future Generation Kiosk Products. 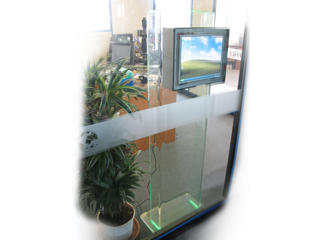 Our innovative new design for this Through Glass kiosk, means that there is no installation. It is not necessary for you to have the through glass sensor bonded to your window, and the kiosk unit needn't be permanently installed in one location. The units design means that it has a slight forward tilt, so that you simply drop the unit in place, against your window, and members of the public have access to all of your products and services outside of normal business hours.